I can’t count how many times I have been asked “how do you choose the fabric for your quilts?”. Most of the questions are about color and print and how to choose the right ones. So, below I will share some of my insights and hopefully those will help you in choosing fabric for your next project! 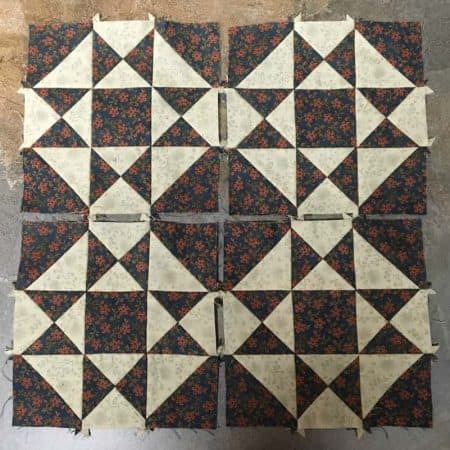 Tip #1: As a beginning quilter, your first instinct will be “I want the fabric used in the quilt in the pattern photo.” However, that is often not possible. Quilts for publications and books are usually made 6 months to a year before you see the finished product. Those fabrics are most likely are not available any more. So, my advice is to choose the fabric by the color, not the exact fabric you see in the photo. Here’s an example. 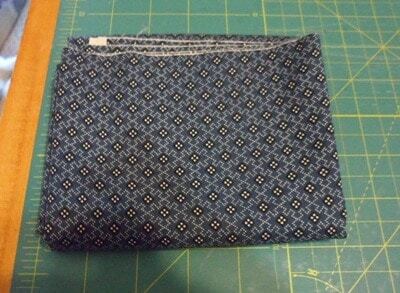 The fabric on the left is the original fabric in a quilt I wanted to reproduce. 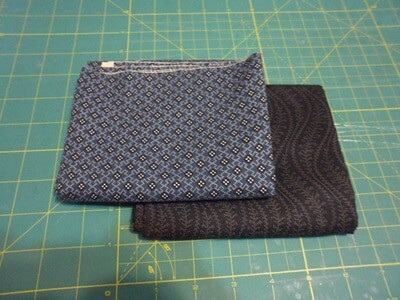 However, that fabric was not to be found anywhere, so I chose the fabric on the right. Notice how I stuck with the similar scale in print and similar shade of red. This fabric will “read” like the original fabric! Tip#2: Try to pick prints that don’t battle with each other but are diverse enough to keep the eye moving over your quilt. I like to pick prints with different scales, but not too drastic of a size difference. Some small, some medium and some a little bigger. But, if I have one fabric that has a very large scale print, I keep the other fabrics on the smaller scale so they compliment the larger scale fabric instead of fighting with it. They are not exactly the same print size… and that helps to give your quilt a personality. Imagine if all the fabrics in your quilt had the print of the green fabric. It would be a little more “ho hum” than if you used the stack above. Notice how I drew the colors out of the large scale print fabric to round out my fabric selection. 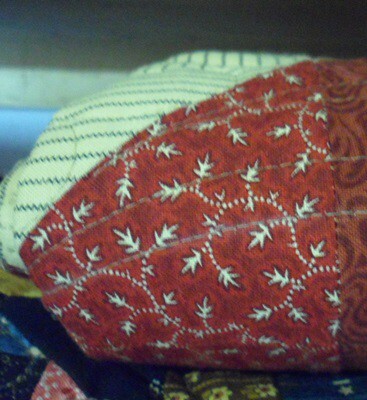 But also, notice how the fabrics I chose have different scales of prints…. just not as large as the focus fabric. You want a range of fabrics of different shades. 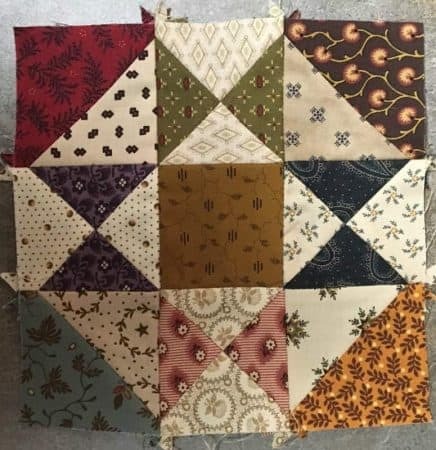 If you make your quilt from fabrics of all the same shades, like all light, it may not highlight your design as well as if you have a variation of shades. 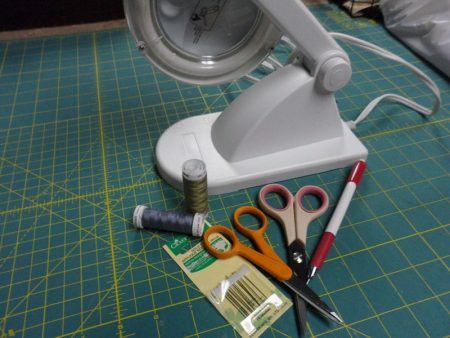 Tip #4: Audition fabrics for a quilt by picking them out and laying them on a table in a well lit area. Then stand back and look. If a fabric sticks out (and not in a good way), pull it out and replace it with another. Keep doing that until you are happy with your array of fabrics. 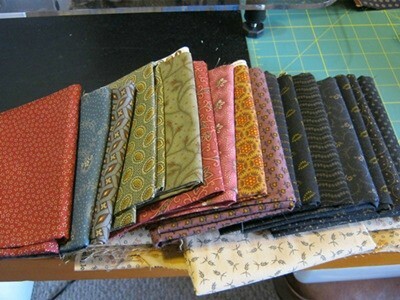 Here’s a stack that I auditioned for a quilt. So, that’s a few of my tips. But if you still have trouble picking out fabrics, there’s always help at your local quilt shop. Take the pattern with you and they’ll be happy to help you. Let me know if you have additional questions on picking fabric. I’ll see if I can answer them. Like anything, practice will make you better at choosing. 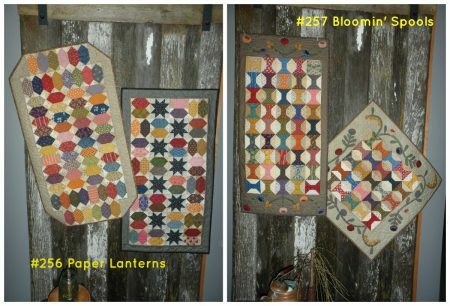 I look at some of my older quilts and notice how “flat” they look compared to ones I make today. It shows that I’ve improved my skill of choosing fabrics. Happy Fabric Shopping and Quilting! I love scrap quilts. I think the more colors the merrier! 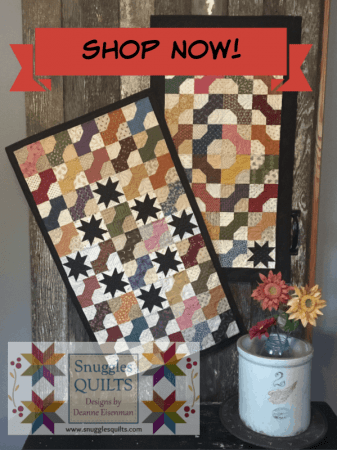 Not that one, two or three color quilts are not beautiful …. but a large variety of colors can make a simple pattern look more vibrant. At least in my opinion! 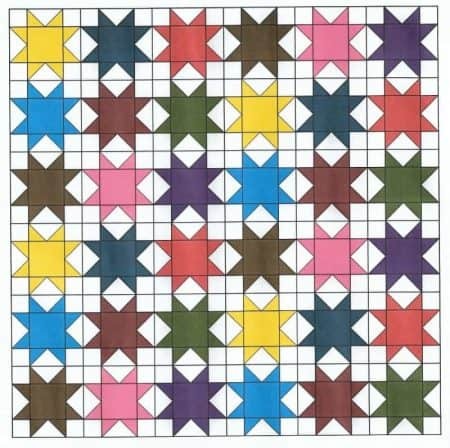 So, let’s say you have a quilt that requires 1 yard each 3 fabrics and has 36 blocks with instructions to make 12 blocks from each color. For my example, I’ll use yellow, red and blue. This would be a pretty quilt! 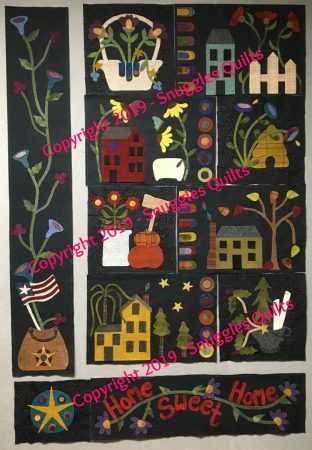 However, what if you want to turn it into a scrappier quilt, instead of buying 1 yard each of the 3 colors, split the yardage up into smaller amounts to add in more colors. For example, instead of 1 yard of yellow, buy 1/3 yard of yellow, green and orange. Do the same thing for the blue and red fabrics. 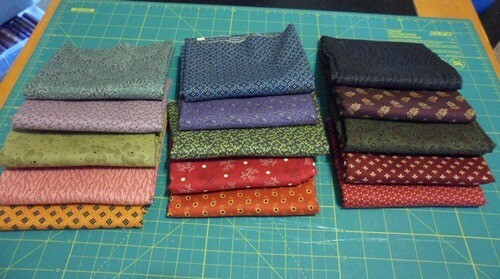 As you can see above, I now have nine fabrics to work with! Instead of 12 yellow blocks, I will have 4 yellow, 4 orange and 4 green. Instead of 12 red blocks, I will have 4 red, 4 pink and 4 brown. And finally for the dark blue, I’ve added in light blue and purple and will have 4 of each of those blocks. So there you go…. instant scrap quilt! Here are some real blocks demonstrating what I was talking about above. First, here’s 4 blocks all the same color. Now, I have taken away 3 of the blue blocks and added in a green, a purple and a red block. Another way to make a quilt scrappy is to actually mix the fabrics in the same block. Below, you will see that I am using the same 3 colors for the 3 blocks, but the each color is in a different part of each block. Finally …. true scrappy! This is where you sit next to your basket of scraps and pull out a new color for each section of the block. Picking Fabric Like a Pro! 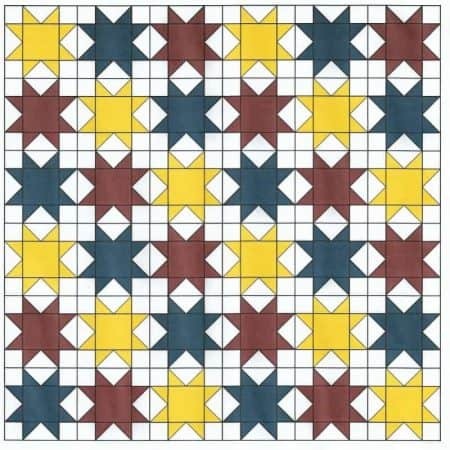 Have you ever picked up a quilt pattern and wondered “how am I going to get my quilt to look like the sample”? Well, it’s easier than you think! 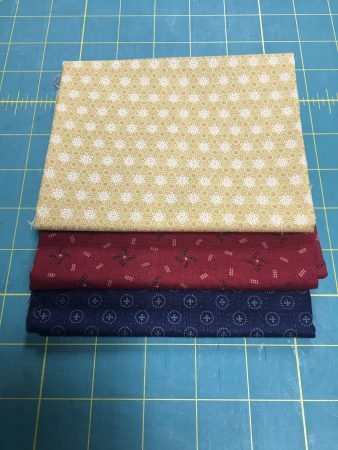 First, I’ll share a secret with you … maybe it’s not such a secret … but when you see fabric in a quilt, whether it’s an individual pattern or in a magazine, most likely that sample was made 6 months to a year ago! 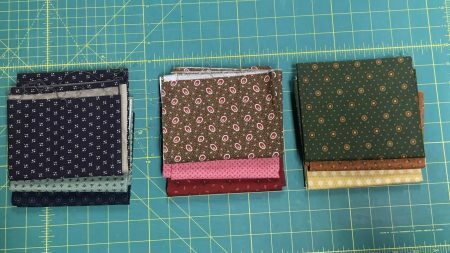 Unless a fabric company has a sample made with new fabric not in stores yet and plans to have the fabric and the pattern debut at the same time, you might not find the exact fabric shown in the pattern. Often fabric companies print limited quantities of a line and when it’s gone, it’s gone! 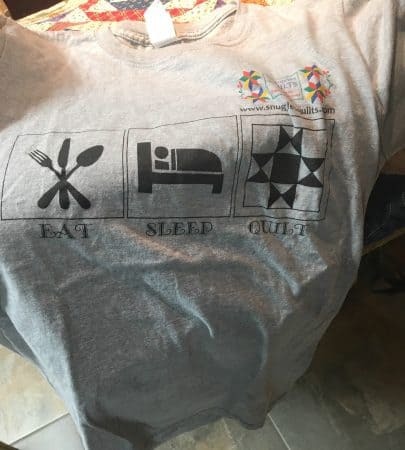 So what’s a quilter to do? Search for fabric by color family and print size so it reads like the original fabric! If you can’t find this exact piece of fabric, then you look for something in the same color family and shade. 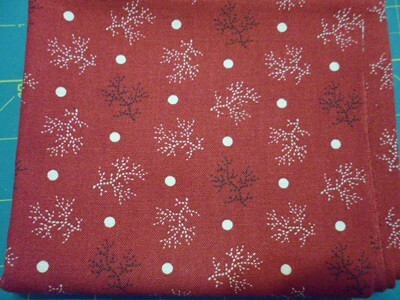 So here’s a piece of fabric that is close to the same shade of red and also has a print about the same scale. That first blue is lighter so you can use it as the “light”, if you are only using 2 blues in the project. Or it can be a medium blue if you are using 3 blues in the project. Look at this next picture. I have 3 stacks of fabrics next to each other. Lights, mediums and darks. 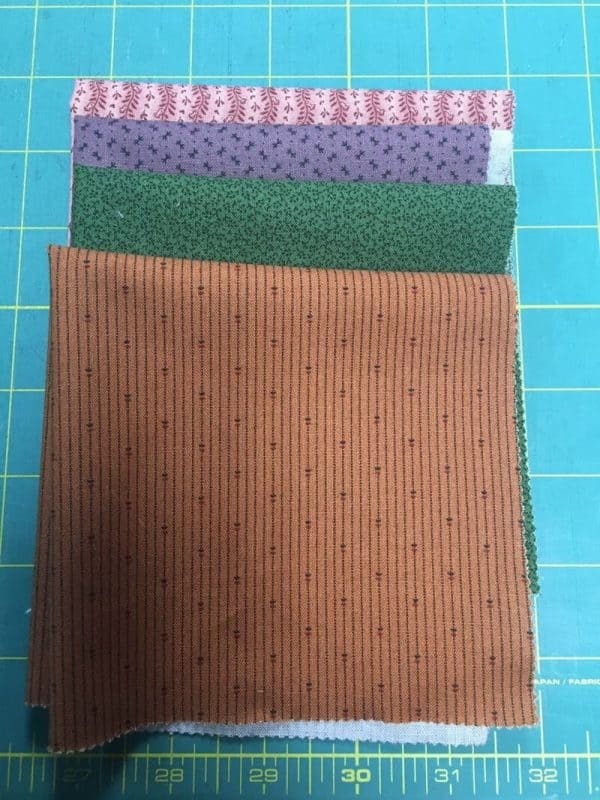 Some of these fabrics are the same color (there are 3 blues and 3 greens for example), but with the variation of shade and print it looks like you have 15 different colors. That’s the fun of scrap quilting! So head to the fabric store and start stacking up the bolts! Once you get that fabric home, make sure it’s prepared and ready for when you want to start your next project. If you are a pre-washer, get the fabrics washed, ironed and folded. 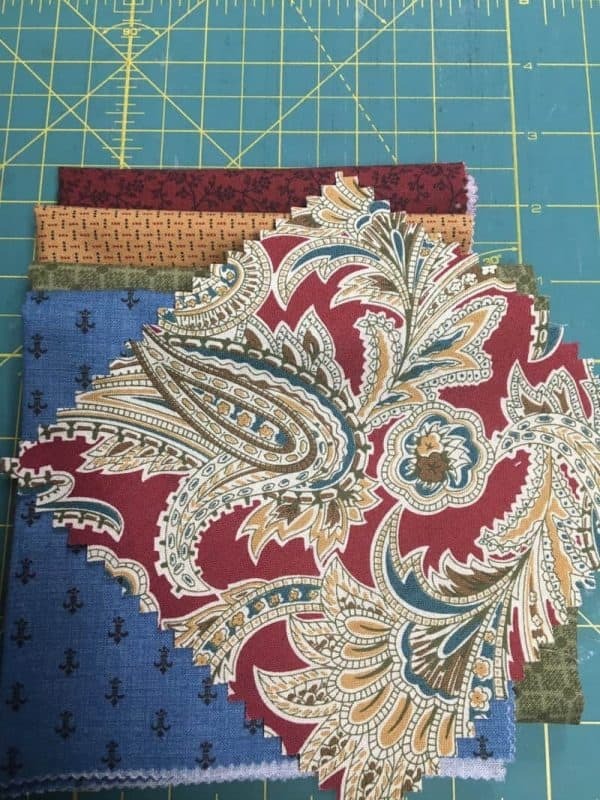 If you like scrap quilting, cut your larger pieces of fabric into fat quarters, fat eights and strips. 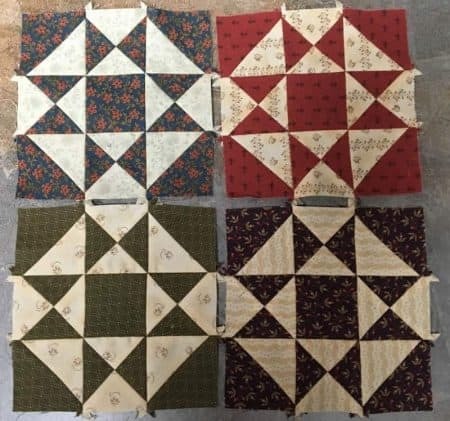 Then you are ready to pull out smaller cuts when needed or pile up a rainbow of strips for that log cabin quilt! 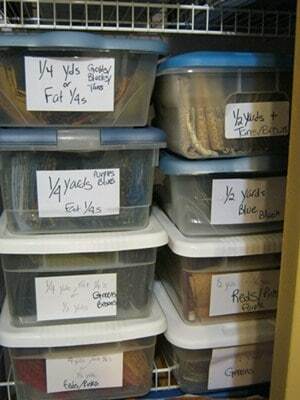 Organization keeps the fun happening!